If you are looking for a small pool table that is comparable to a professional table, then look no further. The Bello Games Deluxe Folding Pool Table Extra Large 44’’ is a commendable work of art. The craftsmanship exerted in producing this table is full of thought. The Bello Games mini pool table is one to have and enjoy for many years to come. 3 What makes Bello Games Deluxe Folding Pool Table Extra Large 44" the best portable pool table? The Bello Games New York Deluxe Folding Pool Table may come with a name of “extra-large”. However, it is in reality just a way to refer to its size among other small pool tables. What I mean about that is it’s the largest from the array of portable pool tables produced by Bello Games. 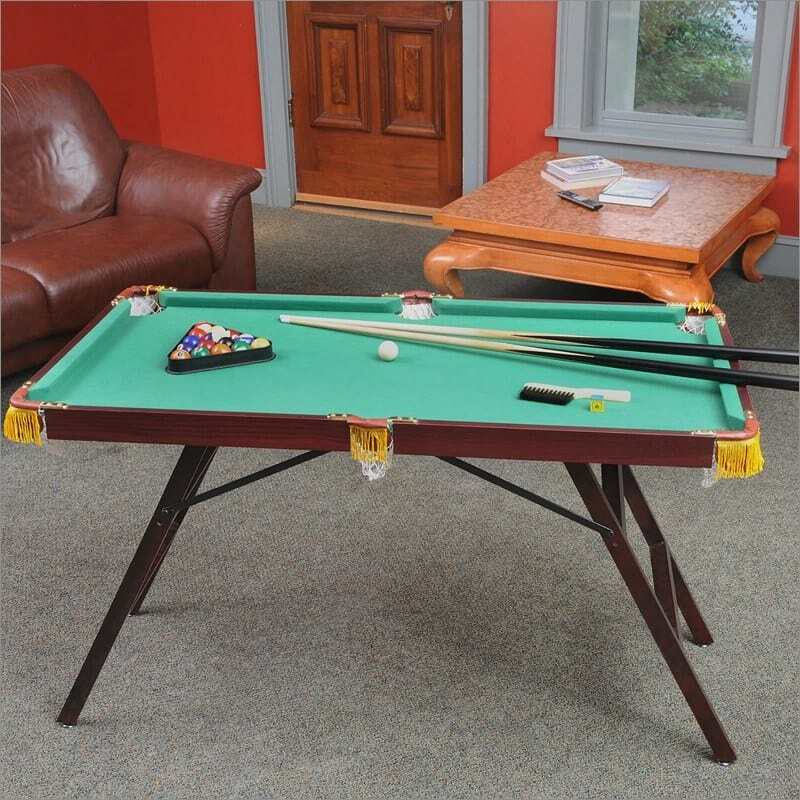 What makes Bello Games Deluxe Folding Pool Table E﻿xtra Large 44" the best portable pool table? Seen in the photo is a Bello Games Deluxe Folding Pool Table Extra Large 44" set-up conveniently within the living room. The Bello Games Deluxe Folding Table is made of materials that are built to last. Its hardwood frame and folding steel legs makes it sturdy and elegant at the same time. Its playing surface is one that is comparable to professional pool tables. The only thing is, you get all that beauty and perks in a smaller package. What you’d absolutely love about this table is that, it is the perfect family pool﻿﻿﻿ ﻿﻿table that requires minimal room space. Dimension: 44" X 24" X 30"
What makes Bello Games Deluxe Folding Pool Table Extra Large 44" the best portable pool table? This table is very easy to set up, totally manageable to maintain and also easy to store. Should you need to go to a function and wish to bring this, no worries too, as the Bello Games small pool table is also portable. All you need to do is to fold the legs and load it in your car. Storage is no fuss too as this fits under your bed or even in a closet vertically. The best thing is that, you get to enjoy a professional looking table for a very affordable price. The Bello Games Deluxe Folding Pool Table E﻿xtra Large 44” has 69% 5-star rating, 23% 4-star rating and 8% of the rest of the rating values. The average overall rating for the table still stands at 4.4 out of 5 stars.